Underfloor heating, both wet and dry systems, are increasing in popularity in the UK. Cheap and efficient to run, they can warm a work space or home for far less than that of a conventional, radiator system. 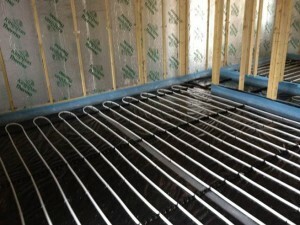 Underfloor heating is installed below the top layer of flooring. It is a form of radiated heat, meaning it heats objects around and above it which in turn heats the room above. In order for underfloor heating to work properly, it needs a thermal mass that it can heat so that the heat is radiated throughout the room. And screed floors are the perfect solution. Is there a specific type of screed flooring for underfloor heating? Concrete has fantastic thermal conductivity prowess. In other words, it efficiently grabs heat from the plastic piping through which hot water circulates beneath the floor thus making for an efficient heating process. All screed and concrete floors are suitable for use with under floor heating. However, the underfloor heating system will perform differently based on the type of screed floor installed and the depth of the product being used. The deeper the screed floor being installed the bigger the delay in heating up and cooling down of the underfloor heating system. Underfloor heating manufacturers suggest that you pay close attention to the amount of time you require for the system to respond to requests in changes of temperature. A screed floor doesn’t just grab the heat, it holds on to it too. The longer the screed floor remains warm, the less effort and energy the underfloor heating system will use to heat the room. Whilst this sounds the ideal solution, getting the mix of screed floor wrong for underfloor heating can mean the system overheats too as the floor is too efficient at grabbing and holding on to heat. At Midland Flooring, we usually recommend a Liquid Flowing Screed for underfloor heating as all the evidence suggests that this product provides optimised heat output. 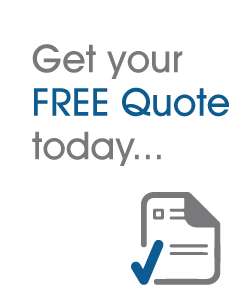 At Midland Flooring, we believe in offering the best quality product at the best prices. Screed floors for underfloor heating are affordable and with our expert, qualified installation team on the job, your screed floor will be laid within no time. Drying time is also minimal, with the screed flooring best left to cure or set without force drying, as this can compromise the strength of the final product.